Before I start the review proper, I have a few confessions to make. Firstly, my experience of N.O.V.A 2 is mildly limited by my possession of a 3rd generation device. 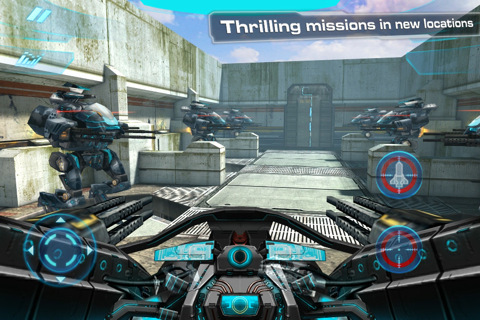 The game features two control techniques, one of which uses the gyroscope only present in 4th generation devices, so I was unable to assess this control method. From what I’ve heard, however, it’s an improvement on the more fiddly method used on older devices, which itself is more than good enough. Secondly, I’ve never played the original N.O.V.A, so I can’t judge the improvements of the sequel over the original game. Now that that’s out of the way, I have to say that N.O.V.A 2 is a blast. The first-person shooter makes an attempt at tackling console-level graphics and gameplay on the small screen and whilst it’s not entirely successful, it’s a powerful enough experience to make you keep coming back for more. Of course, with great power comes great power consumption, so the majority of the time that I played that game I was hooked up to some form of energy supply – not ideal for a mobile game. The most striking thing about the game is its visuals, which sparkle and gleam in all the right places. Futuristic buildings, jetpack-toting enemies and more are all presented in the most visually satisfying way possible. The best thing is that almost everything runs smoothly, with few instances of jittery enemies or hesitant explosions interrupting the experience. This smoothness extends to other areas of the game. Unlike the pitiful stupidity of the enemies present in Gameloft’s Silent Ops, the AI is here far more intelligent, making the flow of each burst of action feel far more natural and satisfying. The game controls are also smooth, transposing complex console controls onto a touch screen with grace. Weapon changing is as easy as swiping an icon; throwing a grenade requires a simple tap of a button. The control method that I used features a movement joystick on the bottom left of the screen, a fire button on the bottom right, with other abilities placed conveniently around the screen. Moving your finger around the screen allows you to aim. As far as I understand it, the gyroscope technique allows you to tilt the device to aim, freeing up a finger so that you can cope with the game’s demands more easily. Occasionally, you might press one button when intending to press another – reloading rather than throwing a grenade, for example – but such mistakes are not common and rarely interrupt the game. If you’re worried about N.O.V.A 2 lacking when it comes to content, you shouldn’t. It comes with a single player campaign and online (and local) multiplayer. The campaign includes 12 lengthy missions (with three difficulty levels for each) across many different environments, and easily takes 5 or 6 hours to complete. I’ll confess (again) that due to time constraints I didn’t complete the campaign before writing this review, but I’ve already been playing it for a solid 4 hours and there’s plenty more for me to play through. The length of the game sounds like an overwhelming positive, but it does come with a downside. Although each mission tends to be different from the last – in one you might command the turret on a giant mech, in another you’re defending an area from waves of enemies – within missions themselves, there is little variety. Levels are also long, many taking more than half an hour to battle through. Doing the same thing for an extended period of play can drag a little. Still, the variety of content across the different missions has to be applauded. The multiplayer is even more enjoyable. It comes with a load of maps, a level-up system, tons of different modes and more. Modes are the usual fare – free play, team deathmatch, capture the flag and so on. You won’t struggle to find people to play with, and can generally leap straight into games. There are a few quirks with the multiplayer, though. Often, you are spawned next to enemies or battles, meaning that you may well be killed as soon as you’re given a new chance at life. Maps are quite large and can hold up to ten people, so sometimes you might be hauling your gun around and feeling lonely for a while before you find someone to target. The worst thing about N.O.V.A 2 is its lack of originality. It’s very heavily ‘inspired’ by games like Halo, and brings nothing new to the table itself. I don’t know why, but some parts reminded me of Timesplitters – shooting explosive barrels conveniently placed next to gung-ho enemies, resulting in their sudden demise – but that’s probably just me. Timesplitters was better, of course. The point is, if you’re a fan of first person shooters there’s nothing in this game that you won’t have already seen in tens of games before it. You might have noticed that I’ve not yet mentioned the app’s storyline, mainly because it’s rubbish. A terrible plot, when coupled with appalling voice acting and ugly stabs at humour, is not the most appealing thing in the world. Thankfully, the story is very much second to the gameplay. All in all, the game is very much a house built on solid rock, but lacks any unique traits. It comes with masses of variety, with vast numbers of enemies, weapons, environments, campaign missions and multiplayer modes. If you’re looking for an entertaining, console-level-ish first-person shooter on a mobile device, N.O.V.A 2 is just the game for you. I like the new concept that this NOVA game brings and I can see the effort that has been put up to make this game stand out. Although much of the storyline is the typical run-of-the-mill, shooting people still gives you an adrenaline rush. I would love to play this kind of a game in a bigger screen though (such as an ipad) where my hand does not block most of the action going on in the game and i feel the scope of fps games on mobiles is very limited. The controls also seem a little difficult and laggy at times. But i would not take points away from the game just for that. I would instead recommend people to use a Detachable Gamepad Controller such as this one from JsxlTech. It’s really a boon for gaming devices with small screens.